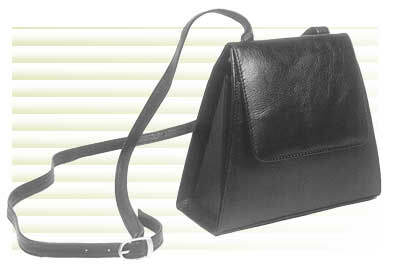 A cow nappa lady's evening bag with a rectangular base and circular sides. It has an adjustable strap, which is attached to the bag by frosted silver accessories. There is a zip pocket on the back and a small zip pocket inside the bag. This ladies evening bag, made from a soft crush nappa, has triangular sides & a rectangular base. Frosted silver accessories have been used. There is zip pocket at the back & a small zip pocket inside. The top closes with two press buttons; the flap with a magnetic clasp. 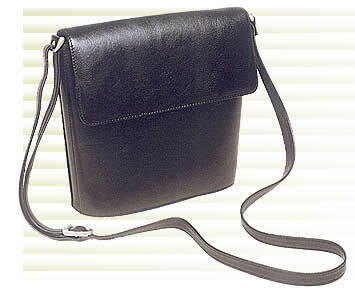 A thin shoulder strap has a belt-like system for adjustment. The cylinderical shaped bag wears a different outlook for the evening. The taper at the bottom gives it a nice shape. It has a small zip pocket in the inside. The top shuts with a zip pulled by a frosted silver accessory. The shoulder strap can be adjusted with the help of the frosted buckle. 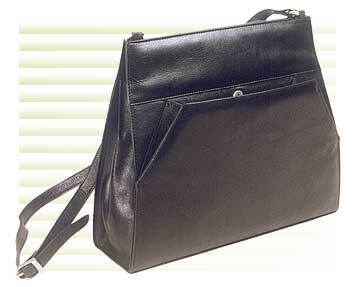 This crush nappa bag fits a lady at the office as well as at a party. 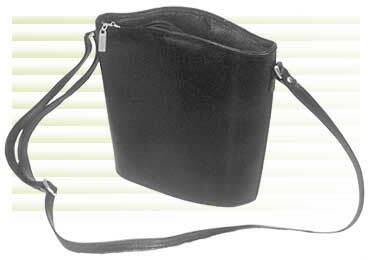 The external pocket, closed by a magnetic clasp, has a size of 36 x 22.5 cm. The top of the bag closes with two magnetic clasps. A shoulder strap, based on the belt system, attaches to two frosted D-Rings diagonally located on the top. The interior is partitioned into two areas -- the front area has credit card slots, pen loops and a cell phone holder and the second part has a zip pocket and plenty of space.